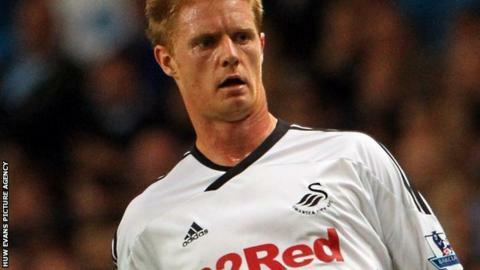 Swansea City defender Alan Tate will miss the next two games after suffering a calf injury. Tate, who broke his leg in August and has played only five games this season, broke down during the warm up before Saturday's home game with Blackburn. The 29-year-old hopes to return to fitness to face former club Manchester United at Old Trafford on 6 May. "His powers of recovery are usually very good so we will assess things," said manager Brendan Rodgers. "His timing hasn't been great as far as injuries are concerned this year, and it's been disappointing for him because he has been a key member of our group since I've been here." Tate captained Swansea in the opening game of the season at Manchester City, but he made only one more appearance before breaking his leg at the end of August while playing golf. He returned to the side in March as a second-half substitute and has made two other appearances from the bench since then.